The restoration works of the coastal levees adjacent to important facilities is scheduled to be completed by the end of March 2013. The emergency restoration works of the coastal levees, which raised the height of the levees high enough to sustain high tide or high wave, were completed by August 2011. Currently the project has been coordinated with the region’s other projects; in the pipeline is the coastal levees which will be able to sustain tsunami that has a probability of occurrence at intervals of years ranging from several decades to one hundred and several decades. These coastal levees are scheduled to be completed in five years. 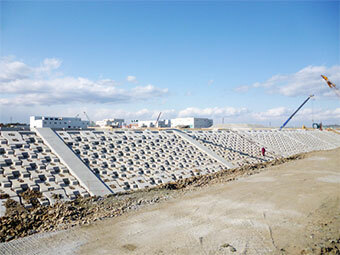 The coastal levees adjacent to important facilities, such as Sendai Airport, the Sewage Treatment Center, etc., are scheduled to be completed by March 2013. Determination of the water level of assumed tsunami, which will be a reference height for a coastal levee to be constructed. Records of the past tsunami heights estimated from the traces it left were organized as a database. Simulation of tsunamis that are likely to be caused by probable earthquakes was performed. Tsunamis that had occurred at intervals of years ranging from several decades to one hundred and several decades were chosen as an assumed group of waves in the calculation of the height. 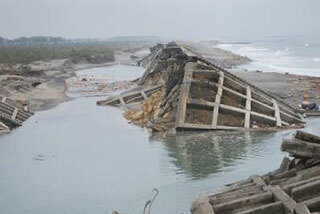 The earthquake debris has been used as a construction material of coastal levees. 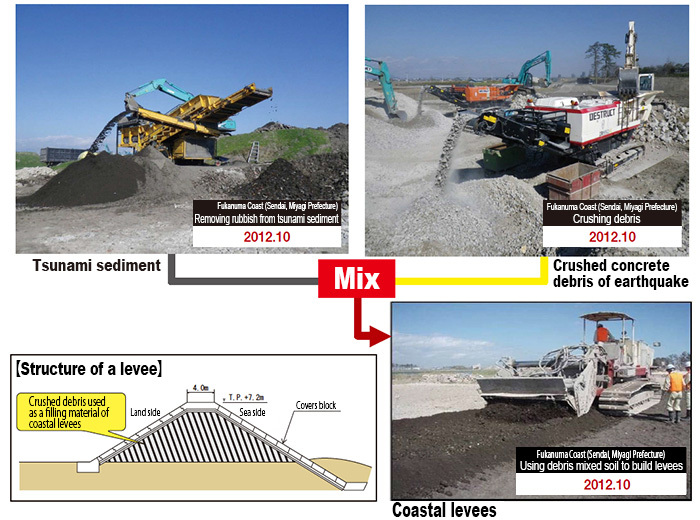 The crushed earthquake debris, mixed with soil, has been used as a filling material of levee in the national coastal levee project. Our support to the affected areas include faster debris disposal, prevention of traffic congestion by introduction of debris transport vehicles, etc.